As we mentioned in the first episode of the Vehicle 2.0 Podcast, the state of California has an interesting requirement for companies operating autonomous vehicles (AVs). 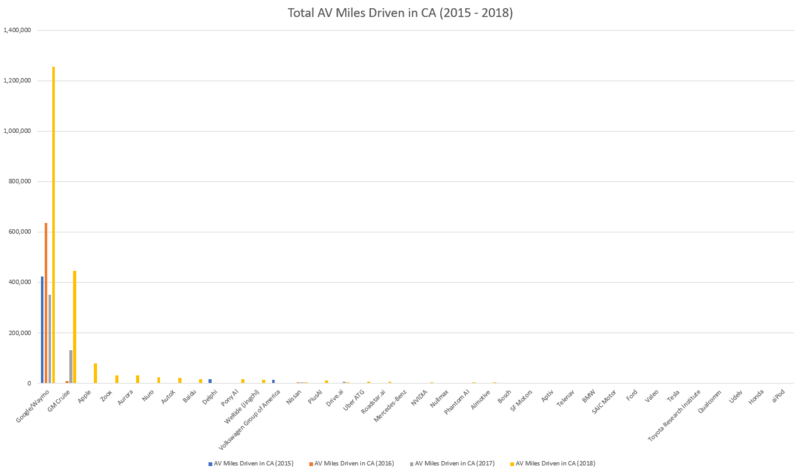 In order to get a license to conduct AV testing, it’s required to submit your mileage data with the state, which then gets published onto the California DMV website. 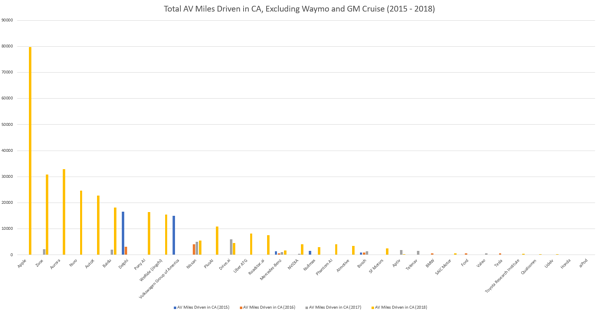 As you can see, Google’s Waymo has maintained an insurmountable lead in total autonomous vehicle miles driven since the data was made publicly available in 2015. GM Cruise comes in second with under 600,000 total miles in the last three years, which is less than Waymo's reported miles from 2016 alone. Even as more competitors enter the space, Waymo shows no sign of slowing down, which is an important indicator for their interest in the wave of innovation moving forward. and on public roads in various locations around the world." They also reported over 1B miles driven to date using Autopilot from their customer fleet. With this perspective, it's easier to see just how many new companies entered the autonomous vehicle space this past year. While the hype behind fully autonomous driving has settled down in recent months, it'll be interesting to witness how many more names get tossed into this ring of innovation. The data gained from all of the physical autonomous miles driven by these various companies can then be uploaded up into the cloud, where they can run simulated miles. In most cases, the autonomous vehicles can only go up to 35 miles per hour on a testing road, so the simulated miles can be used to increase the speed to as much as 100 miles per hour. In Waymo’s case, they’ve claimed to have completed nearly 7 billion simulated miles, which will play a key role in their continued development of truly autonomous vehicles. We’ll continue to monitor the latest news and innovations regarding autonomous vehicles throughout future episodes of the Spiffy Vehicle 2.0 podcast, as well as with our guests, so be sure to subscribe and stay tuned for new releases every other week!